KATHMANDU, Jan 21: The National Resident Doctors Association (NRDA) and the Nepal Medical Association (NMA) have warned of strong protests to pressure the government to fulfill Dr Govinda KC's demands. 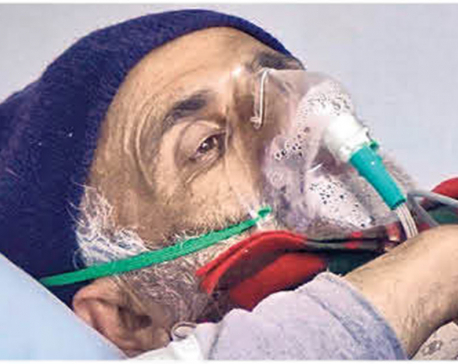 Although Dr KC's 16th fast-unto-death is on 12th day, the government has remained indifferent to his demands. Doctors attending to Dr KC said his condition is still critical as the red blood cells and sugar level in his blood are rapidly decreasing although the risk of pneumonia has lessened. Yet, Dr KC has refused to take medicines. 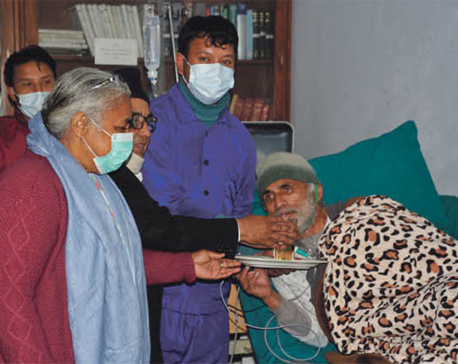 Despite his critical condition Dr KC was shifted to general ward from intensive care unit on Sunday as per his wish. 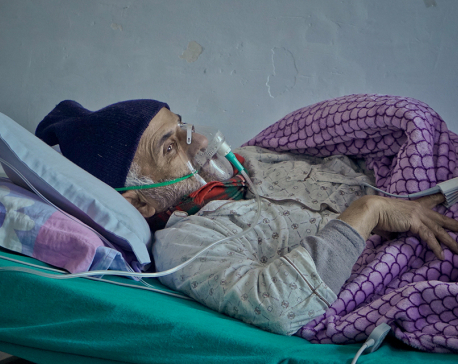 Dr KC had urged the hospital administration to transfer him from ICU to make room for more needy patients. A five-member medical team led by Internal Medicine Department Chief Dr Pradip Krishna Shrestha is involved in the treatment of Dr KC. The team includes Dr Sawin Thapaliya, Prof Dr Divya Singh Shah and associate professor Dr Pankaj Pant. If the government does not take necessary action to address Dr KC's demands and end the strike then we will be forced to launch stringent protests ahead to save his life. The NRDA said resident doctors have started wearing black bands around their arms at work from Sunday itself. “If the government does not take necessary action to address Dr KC's demands and end the strike then we will be forced to launch stringent protests ahead to save Dr KC's life,” said Dr Sumit Pandey, president of the NRDA. The NMA, a professional organization of doctors, also issued a statement on Saturday, demanding that the government address Dr KC's demands. “If the agreement signed with Dr KC is not implemented in its letter and spirit, the doctors will be obliged to resort to unkind steps in order to save Dr KC,” it said, without mentioning when would it start the protest. The NMA also condemned the recent statements of Prime Minister KP Oli, who had taken the initiative to sign the July 26 agreement, for going back on his commitment. Dr KC, a senior orthopedic surgeon and professor at IOM, started his 16th hunger strike on January 9 after the agreement signed on July 26 in his 15th fast-unto-death was not implemented by the government. The agreement included bringing a Medical Education Act, taking action against 43 officials recommended by the report of former justice Gauri Bahadur Karki and opening government medical colleges in all seven provinces as well as making the health education and services easily accessible and available for ordinary people.